In ‘Lullaby Land’ a baby is lulled to sleep by his mother, singing ‘rock-a-bye baby’. The song takes the baby and his stuffed dog to Lullaby Land, a wonderfully surreal land made of plaids, rattles etc. There the baby encounters a parade of baby objects, and a forbidden garden, full of sharp things, like knives and scissors. Despite the warnings of the female choir in the soundtrack, the baby enters. He destroys all watches from a watch tree with a hammer, and plays with matches. The smoke evokes three bogey men, which scare the baby away. Finally, the baby meets the Sandman, who puts the baby asleep to the tune of Johannes Brahms’s lullaby. With cartoons like ‘Lullaby Land’ Disney set new standards for animation that are still thrilling today. Don’t get me wrong, the cartoon is rather patronizing and sugary cute, especially through the soundtrack. But this is compensated by wonderful surrealistic images, beautiful artwork and superb animation. And, hey, this way of warning against sharp things and matches just may work with small children. Lullaby Land itself is a highly original fantasy world, and especially its first images are stunningly beautiful. The dance of the bogey men contains some striking use of color that anticipates similar surreal images in ‘Dumbo‘ (1941). Moreover, it is the first example of totally unrealistic color use in animated cartoons, and therefore a milestone. Unfortunately, the cartoon also marks a trend of childishness creeping into the animation world, not only at Disney’s, but at all other studios, as well. 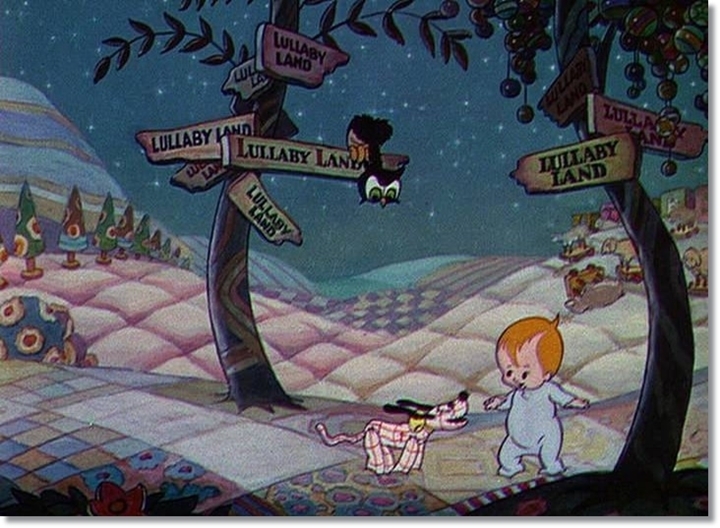 For example, ‘Lullaby Land’ is the first of a whole series of Silly Symphonies obsessed with little babies, and their bare behinds in particular, with ‘Wynken, Blynken and Nod‘ from 1938 being the last example. Anyway, ‘Lullaby Land’ left all competitors far behind. Later, both Walter Lantz (‘Candy Land’, 1934) and Max Fleischer (‘Somewhere in Dreamland‘, 1936) tried to copy the concept with far less convincing results.